When it comes to healthy cooking, the grilling machine that everyone will mention has got to be the George Foreman. 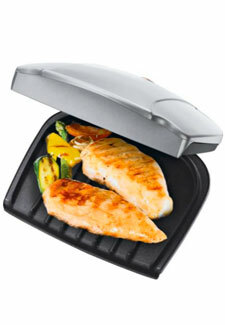 Argos is currently selling the Two Portion Healthy Grill for only £14.39! For less than £15, you can cook two servings at the same time – whether it’s grilling two chicken breasts for you and your partner or cooking a tuna steak and vegetables for a healthy meal for one, dinner can be done in one go! A separate drip tray also comes with this product, to catch any unwanted fat as it runs off the sloped plates. These special plates are non-stick too, making cleaning up afterwards as simple as it is grilling.